It was a pretty somber crowd at the Jewish Community Relations Council's 30th Annual Congressional Breakfast held at their offices and, by the sound of things being said lunch and dinner would not be bringing any happier news. After eleven US Congressmen and the two US Senators from New York finished speaking at the JCRC's Annual Congressional Breakfast to an overflow room of invited guests and media, there is, as the Ernest Thayer poem "Casey at the Bat" declared back in 1888, no joy in Mudville. Speaker after speaker described the details of the economic mess in which our country finds itself. They each warned how dangerous Iran is to Israel and to the world. Unanimously, they declared their support for Israel and agreed that Israel's response to the thousands of rockets fired from Gaza into Israel's cities was proper and justified. 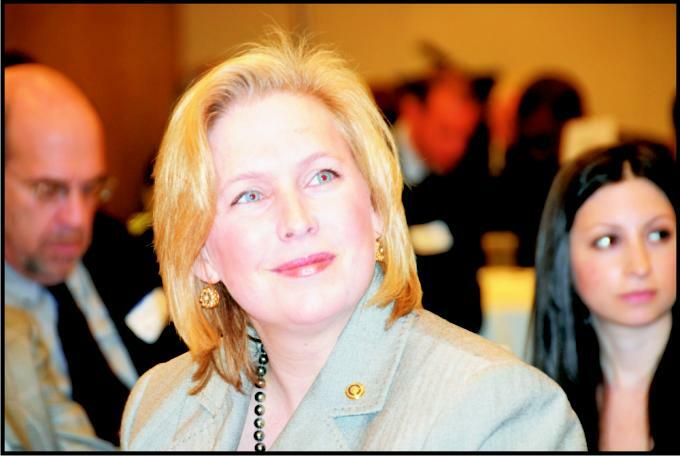 The recently minted Senator Gillibrand pledged to be a partner and advocate for JCRC positions and said she was concerned about the security of Israel and viewed Iran as the biggest threat to Israel and America in the Middle East. Senator Schumer, in addition to telling a few jokes, railed against our need for Mid-East oil and our expense of $1 billion per day paid out, albeit indirectly, to our enemies. But, for a man so concerned with energy independence, it is astounding to us that, given his political clout and his negativity towards allowing our own energy companies to drill offshore and to utilize ANWAR for expanding oil production and increase the use of clean coal he seems to be overridden by his pandering to environmental groups. Mr. Schumer: If you are against sending money to enemy states for their oil and, at the same time you are not in favor of developing our own natural energy resources, then, what, pray tell is it of which you are in favor? When we think of you on these topics, the one word that certainly does not come to mind is genuine. Congressman Ackerman was the most passionate speaker of the group and he could certainly not be accused of sugarcoating the perils that the State of Israel is facing. He said that Iran passed and crossed the nuclear Rubicon without the press reacting to it. He informed us that in Lebanon, Hezbollah, the terrorist organization, has veto power over the government. Egypt has to deal with the Islamic Brotherhood, supported by Iran. He called for support of Fatah over Hamas. And just as the other Congressmen did, he decried the increase in anti-Semitism. Unfortunately, neither Mr. Ackerman nor the other members of Congress appeared willing to cut off the hundreds of millions of dollars doled out to the Palestinian Authority and earmarked for the rebuilding of Gaza until there was full recognition of Israel's right to exist and the teaching and preaching of hatred of Jews and the acceptance and praising of suicide bombing was removed from the Palestinian school curriculum. On a positive note, the bagels and coffee served at the JCRC's 30th Annual Congressional Breakfast meeting were pretty good.